Sorry... the 2017 BMW 530 is no longer being sold as new. 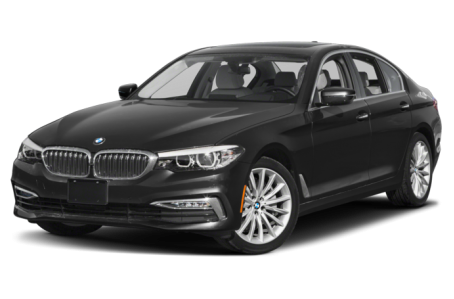 Instead, take the first step to a great deal on 2019 BMW 530 with a free price quote! The updated-for-2017 BMW 5 Series boasts shapelier styling, advanced technology and additional convenience features as well as the promise of improved performance and driving dynamics. Slightly longer, wider and taller, the 2017 5 Series takes on a subtly more formidable presence that belies its substantial weight loss of 137 pounds thanks to the use of lighter materials such as aluminum and high-strength steel. The characteristic widened dual-kidney grille now extends to the twin circular LED headlights, giving more of a flared-nostril effect. Additionally, deepened lower front air intakes further the expression. The profile takes on a groovier, more muscular appearance courtesy of more pronounced character lines stretching the entire length of the car. Around back, the widened-out effect continues with elongated taillights and a lower-slung stance. The cabin's finishes appear to have largely carried over, but BMW said occupants will enjoy increased passenger space thanks to the 5 Series' larger dimensions, as well as a more voluminous 18.7-cubic-foot trunk the automaker said can accommodate four golf bags. Tech and comfort upgrades for 2017 include a 10.25-inch multimedia touchscreen featuring BMW's iDrive 6.0 touchpad and available massaging front seats. Also new for 2017 on the 5 Series is gesture control. Debuting for 2016 on the larger 7 Series flagship sedan, the optional feature enables control of navigation, phone, infotainment and other functions via hand motions. It sounds like a nifty convenience, though it can have unintended consequences such as turning the stereo volume all the way up for those given to cartoonishly dramatic gesticulation (we don't mean us). In addition, BMW said the 5 Series' navigation system assimilates the driver's habits and adjusts future routes based on that information. The 5 Series will be available in 530i and 540i trims, each with rear- or all-wheel drive. The 530i gets a turbocharged 2.0-liter four-cylinder engine that makes 248 horsepower and 258 pounds-feet of torque. BMW said that's good for a zero-to-60-mph sprint of 6 seconds (5.8 seconds with AWD) and a top speed of 130 mph. The 540i, meanwhile, is equipped with a turbo 3.0-liter six-cylinder said to make 335 hp and 332 pounds-feet of torque, good for a zero-to-60-mph time of 4.9 seconds (4.7 with AWD). The 540i also has a top speed of 130 mph, but that clip can be increased to 155 mph for both it and the 530i with the M Sport Package. Both models are mated to an eight-speed automatic transmission. BMW promised improved driving dynamics courtesy of suspension updates and weight savings, but did not provide mileage estimates. Advanced safety features for 2017 include adaptive cruise control that accommodates anything from stop-and-go traffic up to 130 mph (in case that comes up), lane departure warning, lane keep assist with Traffic Jam Assistant semi-autonomous steering, and front crash prevention with obstacle "evasion aid."